When I went to Berlin a couple of months ago, it was the first time I had travelled with just a carry-on bag. Some may squirm at the idea of being limited to just one small bag, but I decided to relish the challenge. Let me tell you though: it was definitely harder than I thought it was going to be. 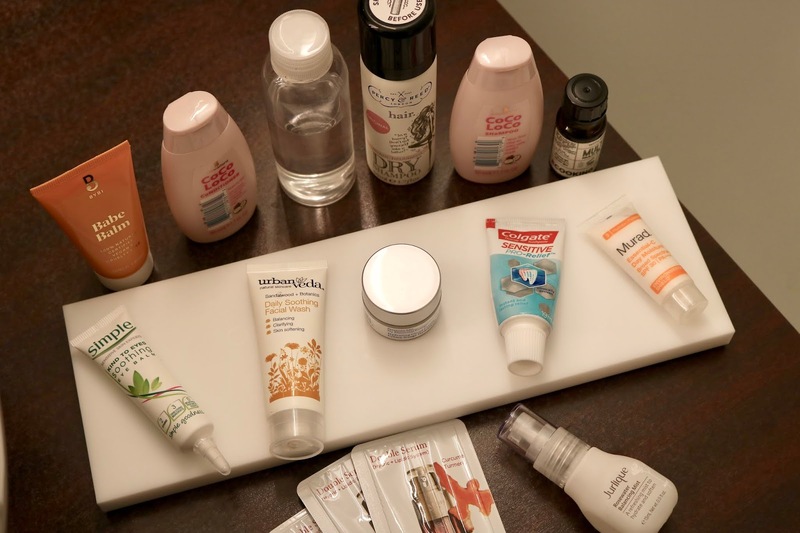 Luckily for me being a blogger and all, I end up with a lot of sample size products that are under 100ml that I keep aside for travel. It may have taken me up into the hour before I was due to leave, but I finally managed to whittle all my beauty products into that one clear pouch that I would need for the next week. So, what made the cut? Let's start with my skincare. 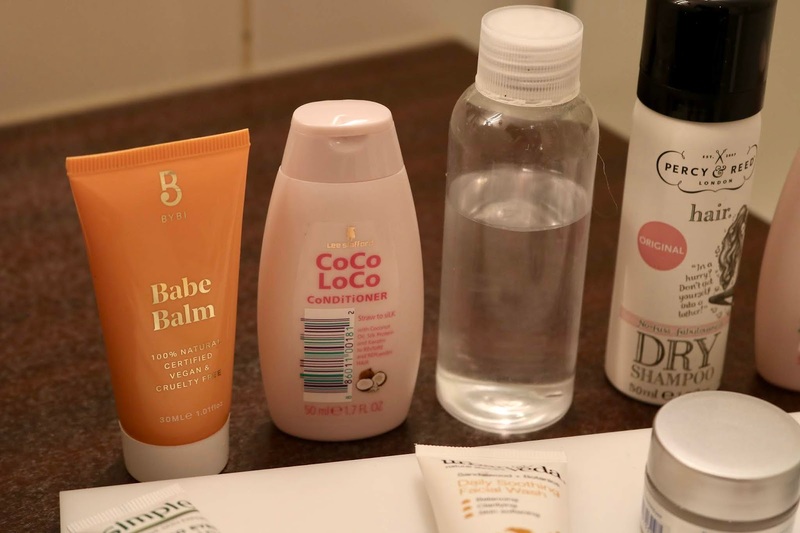 Luckily I managed to fit all the products I wanted to bring that are normally in my routine into my bag, so my skin didn't end up reacting too much to going between the moisture-zapping plane, the heating in my hotel and the freezing temperatures outside. First, we have my trusty Bioderma Sensibio micellar water* for removing my makeup (they are a brand that I've worked with before in the past but absolutely love). This is always a staple for my sensitive skin (you certainly heard me bang on about it enough) so I decanted it into a reusable bottle for this trip. 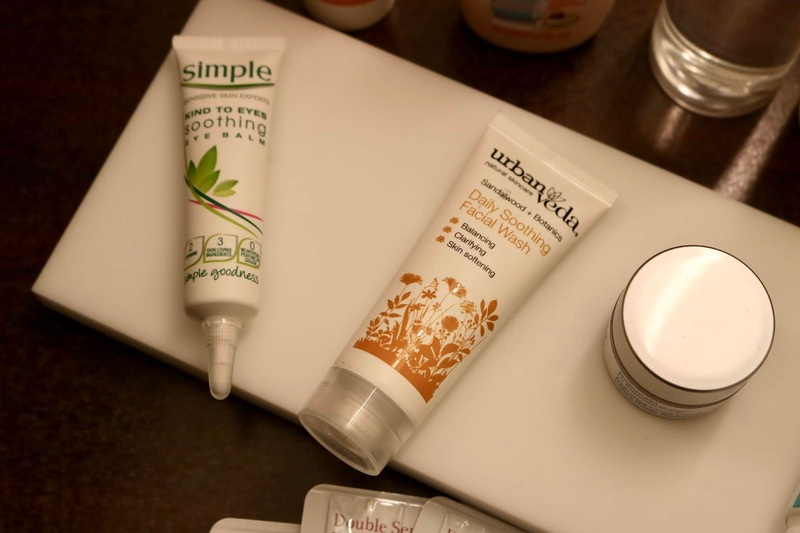 For taking my makeup off at the end of the day, I popped in the Urban Veda Daily Soothing Facial Wash* (worked with them before on this post). Like it says in the product title, this cleanser is really soothing but still gets all the dirt and makeup off my face. It also smells amazing, with the scents of sandalwood and lavender relaxing my senses before bedtime, which helps me get to sleep quicker. As well as those with sensitive skin, this was also great at bringing down any redness brought on by the biting cold air in Berlin, meaning I managed to look presentable most of the time! When I was looking at what toner/hydrating mist to bring with me, I was quite lucky in the fact that the one I was currently using was under 100ml. 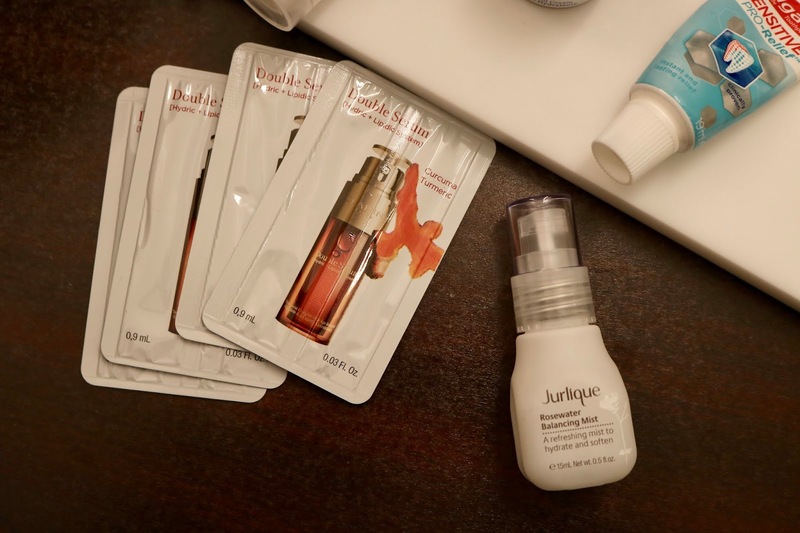 While this mini of the Jurlique Rosewater Balancing Mist* (worked with me on this post previously) isn't very practical in the fact that it's in a glass bottle, I was pretty surprised with how well it lasted the journey. In some ways, because I knew that my carry-on case would be with me most of the time, I knew it would have a better chance at surviving the journey there and back than in the hold. This mist is always so calming on my skin (rose is very good for soothing eczema apparently) and with rose being one of my fave scents, it smells divine. I simply pat this on after cleansing to close my pores and keep the moisture in the skin before applying serum or moisturiser. Speaking of serums, just before I went away I was sent some samples of the Clarins Double Serum* (past work can be found here) in a clothing order which was perfect for popping in my bag without taking up too much space. This stuff is well worth the hype- over the week that I used this my skin felt amazing, and my makeup would apply beautifully after the serum had sunk in overnight. This contains 21 active plant ingredients that help battle anti-ageing and gives you perked up, radiant skin when you wake up in the morning. I managed to squeeze a day and night moisturiser into my bag (had to be a little extravagant somewhere), with my Murad Essential C Day Moisturiser* taking care of my SPF as well. This smells like jaffa cakes, so definitely gives me the incentive I need to keep up my SPF application, even in the winter. As well as protecting your skin against the sun and UV rays (because it doesn't really stop shining through the winter, it's just hidden more), it also creates a barrier for your skin thanks to the anti-oxidants in it, great if you're doing a lot of travelling and putting your skin under a bit of pressure. 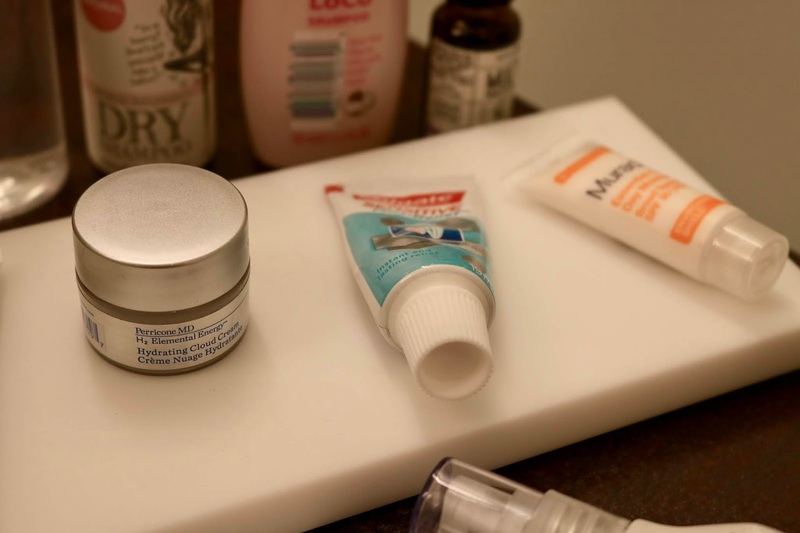 At night, I had a little pot of Perricone MD Hydrating Cloud Cream, a lightweight but super moisturising cream that gives the extra oomph of moisture that I need overnight without sticking on really heavy cream. Unfortunately, this seems to be sold out in most places, but I'm hoping they will bring it back soon as it's such a lovely formula that my skin loves. Lastly, I had to bring my Simple Kind to Eyes Eye Balm with me as it's my go-to cream for my eyes while they're being a bit oversensitive. I've talked about it quite a lot in the past so I don't want to go on repeating like a broken record, but this stuff has been recommended to me by fellow eczema-sufferers and it works a treat. I definitely didn't get to bring as many hair care products that I normally do. I wasn't even going to pack shampoo and conditioner at first as most of the hotels I go to supply them both. But I decided to draw the line at that because sometimes you need to have a combo you trust with your hair and life to avoid any frizzy crazy professor moments. The trusty duo I'm obsessed with at the moment is the Lee Stafford Coco Loco Shampoo and Conditioner* (previous collabs) because a) they smell like beach holidays and b) leave my hair silky smooth with very few fly-aways thanks to the coconut oil in them. I already use coconut oil in my haircare routine at home in the form of the serum I apply after washing, and so this helped me get my hit while I was away. 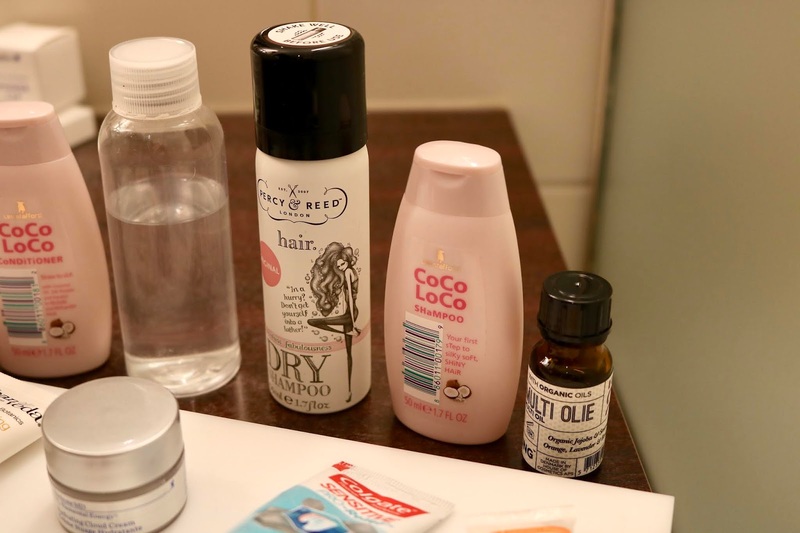 I also love the fact that they sell these mini's in most drugstores, meaning if you forget to bring shampoo and conditioner and are at the airport, you are bound to find them in duty-free! This dry shampoo is a new find for me, and one that I instantly went out and bought the full-size version of when we got back home. I've finally found the perfect dry shampoo in the Percy & Reed Dry Shampoo* (previous collabs) because of the fact that it takes away any grease and gives me volume, without leaving a chalky residue behind and all while smelling really clean, but not in a 'dry shampoo' sort of way. Basically, the perfect dry shampoo. Now for the other odds and ends that made their way into my travel beauty bag that became ride or dies for me. An obvious one first: toothpaste. Not wanting to get tooth decay and bad breath for the week, I popped in this sample size of the Colgate Sensitive Pro-Relief Toothpaste*. After trying them out at a show at London Olympea and then pocketing as many samples as I could carry, I had one ready to pop in for this trip. When it comes to my teeth, I need to be careful of my enamel as well as having a slight sensitivity, and this one is really good at keeping those two things under control. The really cool thing is that you can apply this directly to the tooth for instant relief to sensitivity, great to have to hand if you get a sudden pang while enjoying your food. Now come the multi-tasking heroes of this post. For on the go top ups of moisture for my hands, nails etc, I brought the Bybi Babe Balm* with me and it worked a treat. As well as being great to have in my handbag for this trip, it has now become the product I use on my cuticles at home to keep them moisturised. Going along with my slow transition into eco-friendly products, this is 100% natural, vegan and cruelty-free and come in tubes made of sugarcane rather than plastic. Lastly, I never thought I'd see the day when I found an oil that could do all the things that I normally would use 6 products for. No joke. The Ecooking Multi Oil* (previous work) can be used as a *deep breath* hair oil, cleanser, makeup remover, shaving oil, cuticle oil, serum and many more! I used this as a hair and shaving oil while away, and it saved me so much space in my travel beauty bag as it goes such a long way. I was slightly dubious about it working effectively as a shaving oil, but it gave me a clean shave without hardly any irritation. It does clog up your razor a little but can easily be cleaned off if you give it a little time.